Cream the butter with the sugar until light and fluffy. Beat in the egg and vanilla extract until the mixture is smooth, then stir in the flour, baking soda, salt and 150g Toblerone. Drop leveled tablespoons of dough onto each sheet, 5cm (2in) apart. 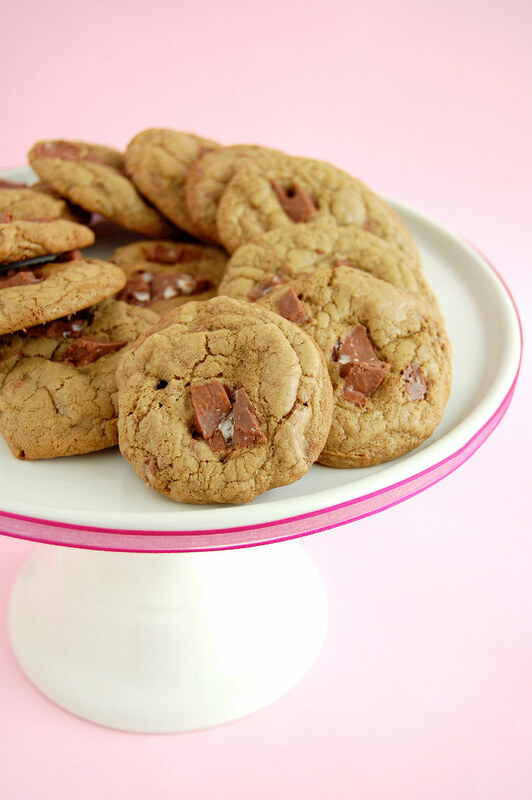 Press the remaining chopped Toblerone over the surface of the cookies. Bake for 10-12 minutes, just until dry-looking and covered with even cracks but not quite firm to the touch. Leave to cool and firm up on the baking sheets for a few minutes before carefully peeling away from the paper. The cookies will keep in an airtight tin for up to 3 days. What is a Toblerone? I can not translate. Can you give me a link to a photo? oh i am in toblerone heaven. what a grand way to use the chocolate!! Recovers! I will look in the shops, cookies are very delicious! Toblerone is one of my favorite chocolates every! Mmmm those cookies look fabulous! these cookies looks so retro dear! Oh, I'll have to bake these for my sis!! She loves toblerone! oh yums. I haven't had that candy for ages but I can only imagine how yummy it must be in a cookie. are these the crispy kinda cookies or the soft kinda cookies? Maybe it's too early for lasagna but it's always time for toblerone cookies !It makes me wanna make a batch right away ! These look so delicious! Actually, I could go for some lasagna right now, cold, please. Yum! I'm obsessed with toblerone. Oh noo, what does that make me if I eat lasagna for breakfast? :P Though I certainly wouldn't miss lasagna if I had these cookies! A friend of mine made these at Christmas and they are delicious!! Yea please! I love Toblerone, but I've never thought of putting it into cookies! I have to tell you that you have such a beautiful blog! I can't wait to see more. Have a wonderful day. Niksya, it's a kind of chocolate, hope you find it there! Paula, yes, they are - I loved Toblerone as a kid, but didn't eat it very often because it was too expensive back then. Mercè, I hope you girls like it! Thank you! Sugar Plum Fairy, thank you for stopping by! They are crispy on the edges and soft in the center. Kirbie, I hope you give this recipe a try! Starts in the City, thank you for stopping by! Jacqui, thank you for visiting! I'm glad you like the cookies!